There is so little information available about Burma (or Myanmar, depending on how you rock it) that after the inevitable Wikipedia entry, the CIA World Factbook is the second item that appears in Google’s search results. This anonymity is largely due to the military dictatorship that has kept the country under lock and key for much of the last 50 years. Even typhoon Nargis, which smacked into the Burmese coast in the spring of 2008 killing 130,000+ Burmese, shamefully failed to change the government’s secretive operations in spite of a large international relief effort. Burma has not always been so mysterious. During the latter half of the 19th century and first half of the 20th, the country was annexed to the British Raj of India (mostly to arrest the expansion of the French across Indochina from Laos and Vietnam), and quickly became an integral part of the British Empire supplying a rich abundance of jewels, hardwoods and spices to global markets. Indeed, the British, favoring the temperate north of “Upper Burma” over the fetid, malarial Rangoon (now Yangon) in the south, made the previously small, provincial town of Mandalay their capital, opening up that previously undeveloped area in so doing. It was during these heady days of fortune-making, steamy nights and opium dens that the sense of exoticism and opulence surrounding the city of Mandalay developed (which the Vegas casino Mandalay Bay riffs off, despite the fact that Mandalay is more than 500 miles inland). Indians, Chinese and Anglo-Indians, their businesses and their foods, flooded Burma under the British, as the new rulers exploited Burma’s natural wealth and pushed railroads deep into the Burmese interior. Prior to this period, native Burmese cuisine had contrasted sharply with its neighbors. It had few of the complex spices of Indian cuisine and lacked the fiery heat of Thai food or the sophisticated salty, sour, sweet characteristics of Chinese cuisines, tending to rely on more subtle flavors and simple techniques. Things changed considerably during British rule, and the Burmese adopted or adapted many of the more generic dishes these foreign groups brought with them, so that contemporary Burmese food, while still distinct, displays these recent influences. Perhaps the most popular dish in Burma though, is a traditionally Burmese dish that has been eaten to celebrate marriage throughout the ages. Own-o Kow-swear (or Own-o Kow-sway/swea’) is a chicken and coconut milk stew flavored with turmeric, garlic and ginger and served over wheat noodles, that due to its bright yellow color is thought to bestow luck on the marrying couple. It is also supposed that the enlivening flavors of ginger and turmeric offer a little extra oomph, shall we say, to the consummation. We first wrote about this dish back in the very early days of this blog — apparently before lighting was an issue in our photography (or retouching, for that matter) — having enjoyed it at one of the (then) only two Burmese restaurants in New York, not to mention one of the very few such eateries in America. Sadly, this restaurant, Village Mingala, closed earlier this year, leaving its sister restaurant on the Upper West Side to fly the flag for Burmese cuisine in NYC, and so to mark its passing, we decided to give home-making Own-o Kow-swear a bash. Of course, as my opening line suggests there isn’t much available on the internet about Burmese food, so we turned instead to the only Burmese cook book readily available in English — The Flavors of Burma/Myanmar — written by Susan Chan, a Burmese-Australian woman of Chinese heritage. From her we learned that since chicken (and other proteins, except fish) have typically been (and, to an extent, still are) exorbitantly priced in Burma, this dish came to be served at weddings as a demonstration of the hosts’ generosity and largesse. We also learned, very interestingly, that these days it is also often served — to those who can afford it — as a breakfast dish because Burmese weddings are most commonly celebrated in the morning, with the celebratory meal served around brunch time. It is hard for us to contemplate eating anything with chicken in it before noon, let alone a bowl of fragrantly-spiced stew and noodles, but, happily, it also makes an excellent lunch or dinner instead. Do not be dissuaded from giving this dish a try, especially if you’ve been nervous hitherto about making Indian or Thai food at home due to the number and/or availability of some of the ingredients. Much of what you need for Own-o Kow-swear can be found in even the most badly-stocked grocery store, and in terms of skills, if you can make a regular beef stew, you can make this blindfolded. Since, for most of us, visiting Burma or even finding a Burmese restaurant is largely impossible, unless something miraculous happens there politically, this dish is about as close as we’re ever going to get to experiencing the unknown pleasures of that exotic and mysterious nation. The really frustrating thing is that once you’ve tried this dish you just want to taste and know more and more about Burma and its food. Here’s hoping that one day, the government’s iron grip will relax, or be cast-off entirely, and the country and its fabulous cuisine can once again by enjoyed by Englishmen (and people of all countries) like me. One of the common themes in Burmese cooking is the use of garnishes to add new flavors and textures to dishes. With Own-o Kow-swear the addition of deep-fried shallots, hard boiled eggs and lemon wedges is typical. The lemon juice wakes up the flavors of the stew at the table, and the shallots and eggs offer contrasting textures. 2 medium shallots, finely sliced into rings or strips. Sprinkle with corn starch (or chickpea flour) and turmeric. Fry in hot vegetable oil for about a minute until crispy but not burned. Boil 2 eggs for ten minutes. Remove to an ice bath and allow to cool completely. Remove and de-shell. Slice in quarters and arrange around plated stew. Slice 1 lemon into eighths. Break down your chicken, removing breasts, legs and wings, saving the carcass for making stock. Toss in chicken pieces and coat with colorful oil, and seal meat on all sides. Warm your chicken stock in the microwave and with a whisk, stir the chickpea flour into it making sure there are no lumps. Scoop ginger, garlic and onion puree out of blender and into pot. Allow to become fragrant for no more than two minutes, stirring well to make sure puree is sauteing. Add chicken stock (with chickpea flour), stir well and bring to a boil. Once boiling, reduce heat to a simmer and cook, uncovered, for 30 minutes. After 30 minutes, add cream from top of coconut milk and a little of the milk. Be careful as you don’t want it to get too watery. Continue cooking at a simmer for a further 20 minutes, or until sauce has thickened to the consistency of a tomato soup. If your noodles are not pre-cooked, boil them now until they’re slightly underdone, and place them at the bottom of a deep serving bowl. 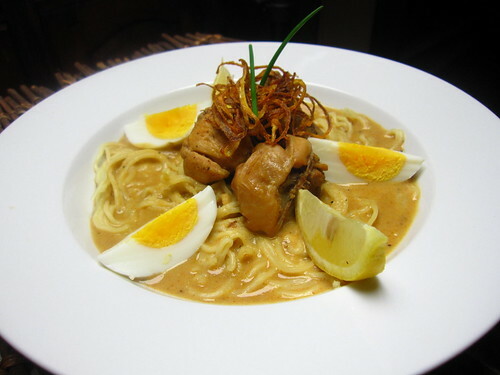 With a ladle, pour the chicken stew over the top of the noodles and garnish with traditional items like boiled eggs, lemon segments and fried shallots. Enjoy your taste of Burma whether its morning or night, wedding or weeknight! This looks absolutely fantastic! Thanks for spreading the word about this type of cuisine! The first and only time I had Burmese food was with both of you in NYC. Despite many pints from McSorley’s next door, the food was both memorable and tasty. @Peter – the company was memorable also. Good times. @Joanne – Burmese take-out? Where? What’s the address? I thought there was only one Burmese place left in NYC? The closest I’ve ever been to Burma was I had a Burmese cat once. I had no idea there were Burmese restaurants in the city. Now I’m really psyched to try one of these rare placed. The dish contains so many of the flavors of SE that I love such as coconut milk and ginger. Definitely looks worth making. It looks so mysteriously delicious. There is a chapter on Burmese foods in Charmaine Solomon’s The Complete Asian Cookbook, and a version of this recipe is included. Up until now I’d overlooked that section pretty much, but you’ve inspired me to give Burmese cuisine a try. I know what you mean about the dearth of info on Burmese food on the Internet. There’s a restaurant called Burma Superstar in SF that has awesome food (though I’m not sure how authentic it actually is), and I always lament the fact that we don’t have much in the way of Burmese Cuisine here. This is funny… I just had Burmese food last night in Boston with friends. I had never had it before; it is a fascinating mix of influences, and reminded me a bit of Malaysian cooking in the way it had notes from lots of other cuisines. The pickled tea was the most unusual component. nice, peter! don’t even get us started on the green tea leaf salad. It is our absolute favorite. I dream about that. So glad you got a chance to try it. You are right… this is terra incognita for most of us. It would be great to find a Burmese cook book from before the foreign invasions.. one wonders what they really did eat and what amazing things have been lost through foreign influences. Great and interesting post… I look forward to trying this dish. Are there still Burmese restaurants in NYC? One – Cafe Mingala on 72nd street. Sadly their other restaurant in the east vill. just closed. we’re mourning the loss. I’m going to try fermenting some sencha and see what I can come up with. dude, i love it. PLEASE let us know how it goes. i will def. want you to teach me that one. Great post, I enjoyed learning a little bit about Burma. Excellent dish too, it sure beats Italian Wedding Soup, doesn’t it? That’s a tough one Chris! I really love my grandmom’s Wedding Soup (http://www.weareneverfull.com/you-dont-have-to-be-italian-or-at-a-wedding-to-enjoy-this-italian-wedding-soup-or-escarole-soup/). and did you know that it’s not actually served at weddings? see the post above for an explanation. Thanks for the comment! Hi, I am a new fan of your blog and I love this post. I grew up in Greenwich Village and besides owning a Burmese cat, we used to have (many years ago) a fantastic Burmese restaurant on the “border” of Chinatown and Little Italy called “Mandalay”. My mother and I were regulars. It’s a shame that this cuisine isn’t better known. Thanks for the lovely recipe. Can’t wait to make some. Hmm. I never contemplate Burmese food and now I am curious. The whole story and struggle of Aung San Suu Kyi fascinates me. I admire her strong will. Asia the Beautiful Cookbook also has a chapter on Myanmar, but I’ve yet to cook from it. I didn’t even realize that Myanmar is Burma. On a similarly Heather-doesn’t-know-everything-Asian tip, I recently reconnected with a Cambodian friend from high school who is a whiz at Khmer cooking, turns out. She’s gonna teach me a thing or two. 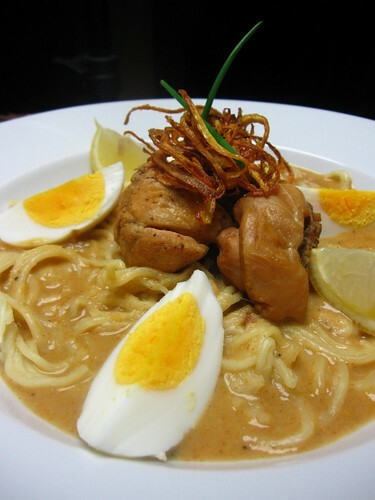 Never heard of this dish (not that I’ve delved deeply into Burmese cuisine much, or at all) but it looks delicious and reminds me somewhat of the Malaysian Laksa I made this past weekend, which is also a coconut broth over noodles with spices like tumeric, garlic, ginger, and so on. 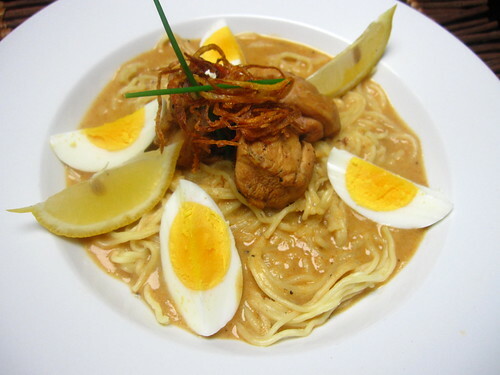 Laksa has variations all over Southeast Asia; could this be one of them? @Lang – i’ve not had a laksa in ages and I hadn’t made that connection, but you could be onto something there. They are certainly similar in that regard, and also in the extensive use of the garnish/condiments. This looks really interesting… I think I’ll give it a try! Oh, the “Old Blogging Days” 2007 was so long ago! We have come so far with our photography!